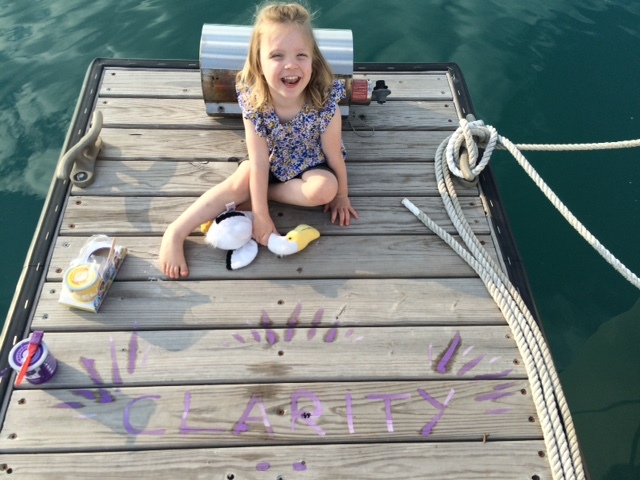 Finally, after another grueling winter that threatened to set up permanent residence here in Chicago, we moved back aboard s/v Clarity Memorial Day weekend for our first family stay of the season. Check out some photos from the weekend at the end of this post! Through March snowstorms and April (and even May) temps in the 30s during mandatory yard work (more on that in an upcoming post), the day she’d be floating again at 31st Street Harbor seemed intangible. Now that we’re here, in some ways it feels like it’s been years, and in other ways, it seems like just yesterday that we were returning from our Michigan adventures late last season. One thing’s for sure: This is home. The evening breezes tickling your arms, the xylophone melodies of the clanging halyards, the constant rhythm of the water lapping against the bow. Remind me again why we live in a place where this reality is impossible for half of the year? We made it to the harbor late morning on Saturday, and there was sunshine to spare as we moved clothes back on board. I did our first provisioning trip (so begins the delicate balance of keeping two homes clean and stocked) while Aaron tackled a few projects on board and reintroduced Claire to the playground and the splash pad and our friendly staff here at 31st Street. As Claire, at 3, is sprouting like a weed, the travel crib in the v-berth wouldn’t work as her bed anymore, so we switched “bedrooms” with her and gave her the aft cabin all to herself. That first night, we braced ourselves for the worst when starting her bedtime routine, as she usually doesn’t do well with change. But after a few stories, that little stinker was asleep within 20 minutes – and she even napped the next day, too! Miracles do happen – on boats. When we woke up on Sunday morning, though, the cold and rain had set in, and pretty much stayed with us through midday Monday. When other boaters head home, though, we see an opportunity to hunker down and get cozy. Lots of reading books in the salon, snuggling up in the aft cabin and “playing friends” with Claire’s stuffed animals, as she calls it. And let’s face it – it’s not a hard-knock life. We have a flat-screen and a pretty robust cable package. We did come up for air a few times – I took Claire to the beach while Aaron went to the yacht yard to knock out some work for Clarity Marine Systems. We ventured out in a torrential downpour Sunday night to Columbia Yacht Club for dinner, and once the weather broke on Monday, we went for a relaxing walk and grilled up corn and brats off the back of the boat. Hey! We made an octopus!